Noble Middle School teammates Xavier Terrell and Aliam Appler travelled to Canton, OH this summer to compete on a national stage. After an unbeaten season and winning the county championship with their Noble Middle School football squad last year, a pair of standout local players, including one from Wrightsville Beach, were selected to test their skills among the nation’s top football players at two events this summer. 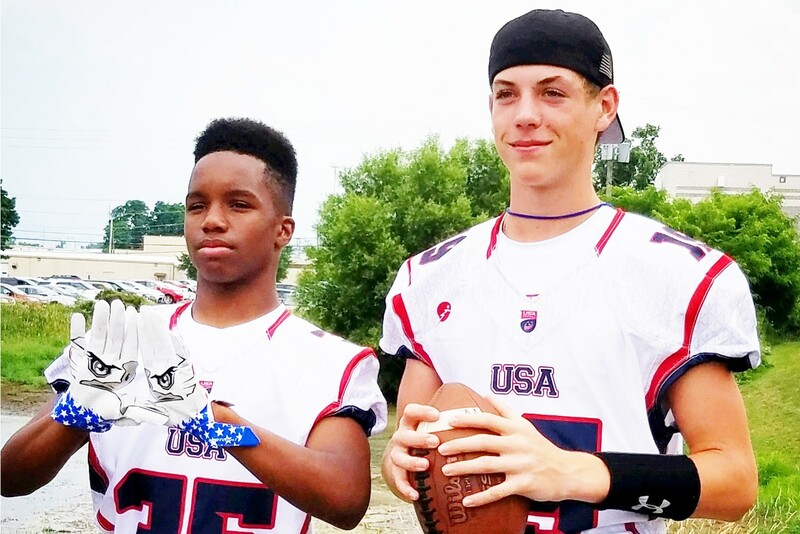 Quarterback Aliam Appler, a Wrightsville Beach resident, and running back/wide-receiver Xavier Terrell traveled to Canton, home to the National Football League’s Hall of Fame, for the US National Football team’s Middle School Bowl Game series. Participating in drills and practice throughout the week led to their performance as part of the 14-and-under Stars team at the Tom Benson Hall of Fame Stadium. While splitting time with their teammates, Appler and Terrell’s efforts attributed to 20 of the team’s 22 points scored in the contest. Appler threw for 171-yards passing and 2 touchdowns, while Terrell ran for 88-yards, 1 touchdown, and a 2-point conversion. On one play, Terrell broke several tackles and sprinted for 66-yards, a great way to celebrate his birthday. During the last week of July, the pair was invited back to Canton for the Pro Football Hall of Fame 8th-Grade All-American game during Enshrinement Week. After sharpening their skills in practice, touring the NFL Hall of Fame, and attending the NFL pre-season opener, the players participated in an East versus West matchup to close out the trip. Appler recorded 144-yards passing and 2 touchdowns. Terrell did not see any touches on the offensive side of the ball, he did log some time at the safety position on defense. “Playing in the Hall of Fame stadium and then being invited to go back to Canton and watch the NFL game were my favorite,” said Appler. Being a part of the winning team in the All-American game was also a highlight according to Appler, because both local players will have their names engraved on a trophy that will forever be on display in the Hall of Fame. Both Appler and Terrell are excited about the upcoming season. Both players said they look forward to helping their Noble Eagles team extend its winning streak when they take on Trask Middle School on September 15.